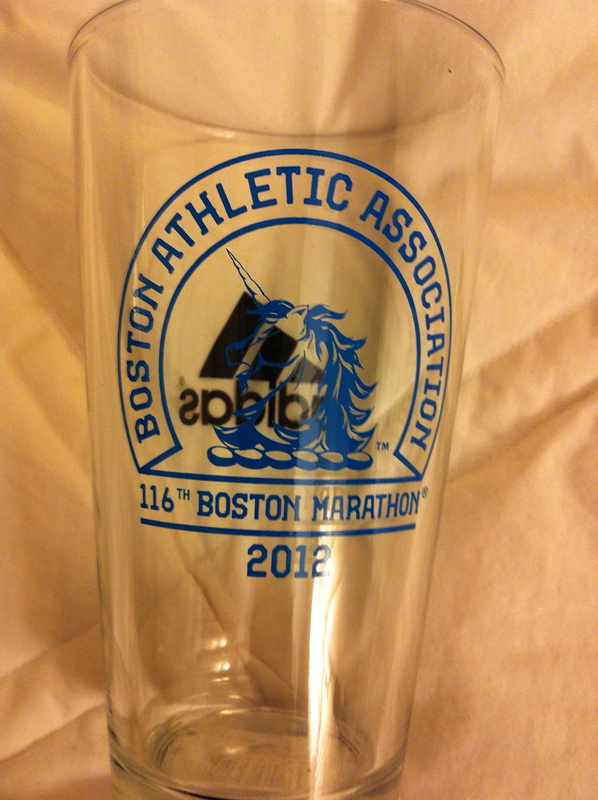 It was such a tragic event yesterday at the 2013 Boston Marathon. Our thoughts and prayers to all of those affected by the tragedy. Also, thanks to those who responded to those in need. Our thoughts are also with those who were displaced and those that are trying to travel home. We hope you have safe travels and are able to rejoin your loved ones as soon as possible. 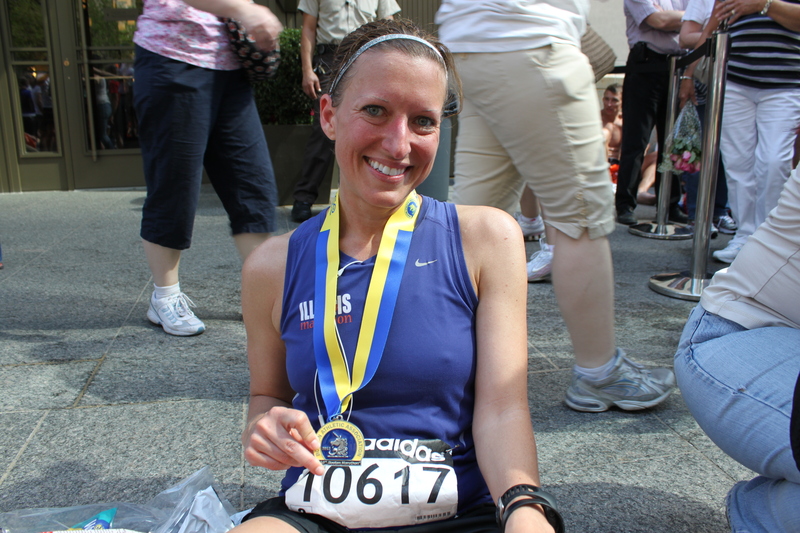 Categories: Boston Marathon | Permalink. 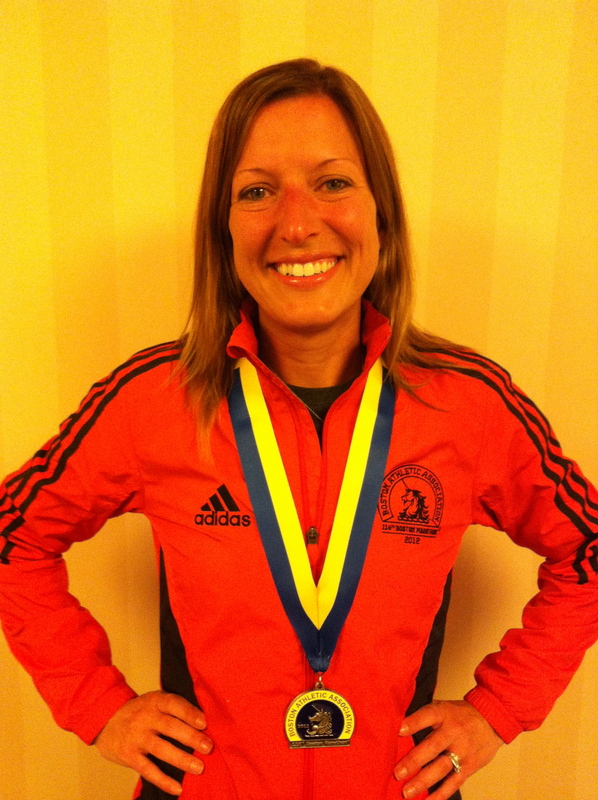 Since it’s April I thought I would write a post about the Boston Marathon. While I won’t be there this year, it is amazing how only just running it twice this race has imprinted upon my life and given me memories I will cherish forever. 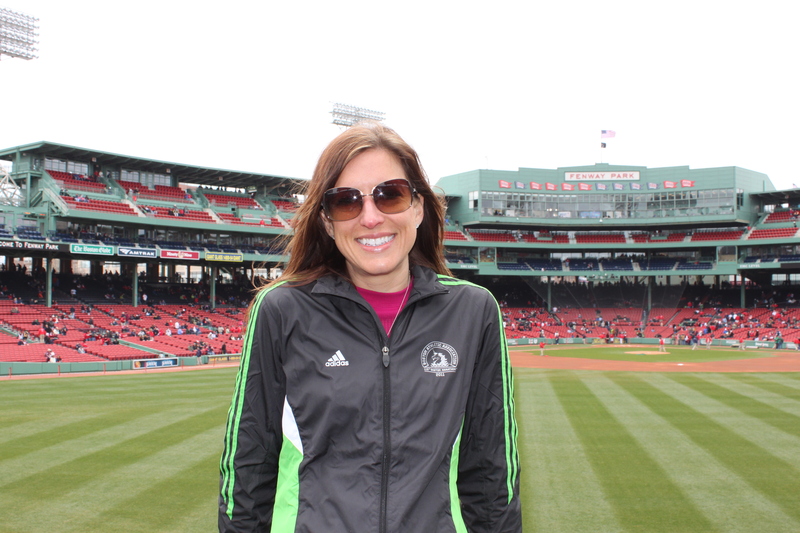 So for those of you heading to beantown for 2013, whether it be your first Boston Marathon or you are have ran it more than once, I wanted to share some of my experiences of things that I enjoyed from my time there. 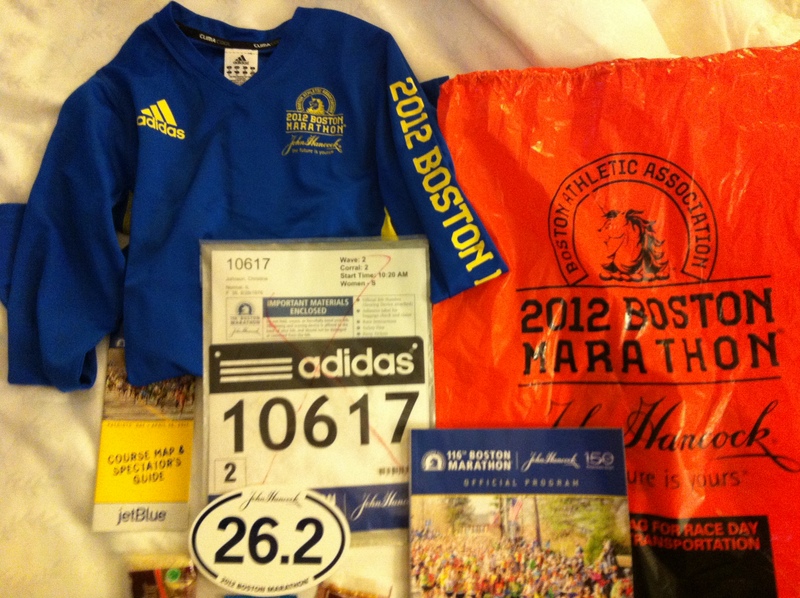 If anything maybe it will get you hyped to read more about the Boston Marathon. I remember all to well trying to fight off taper madness by busying myself with plans of our travel and the race logistics. So here’s a few thoughts on my time there, I hope you find it helpful, or at least entertaining. 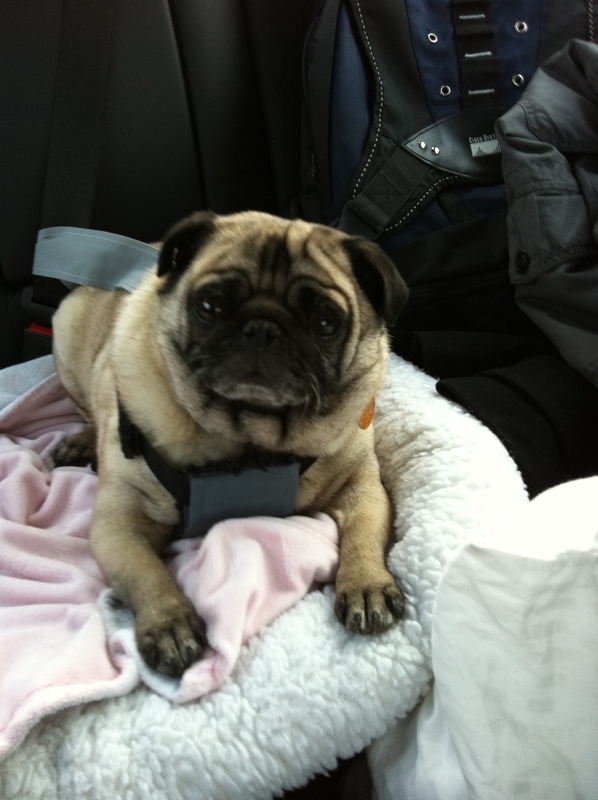 Both trips to Boston (2011 and 2012), Rob, Coco, and I loaded up the car and drove from IL to Mass. 18 hours of driving broken up into two days. Crazy to some? Perhaps. For Rob and I, we enjoyed every minute. We start the trips at night after work (take a little personal time to get out a bit early) and get on the road to knock out the first 8ish hours. Which means that we roll into bed around 11pm-ish (midnight if we’ve changed timezones, which I think occurred). Then the following day we got up early to get the next 10 hours of driving accomplished. People have asked, “You guys fly (have a plane), why not fly yourselves there?” or “Why not get a commercial flight, it’s the same/cheaper than driving?”. Good questions. 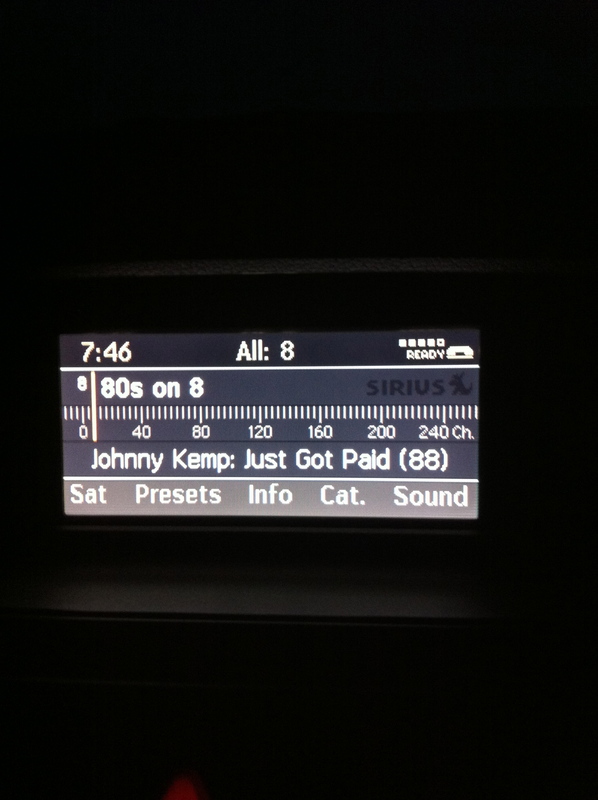 Driving for us was never a cost thing, it basically evens out between gas vs. tickets/bags. We don’t even use our car when we get to Boston, so it’s not that we need it there or anything. 2) Rob and I haven’t seen much in the Eastern states. For our first trip this would was big factor because it would give us an opportunity to see each state along the way. 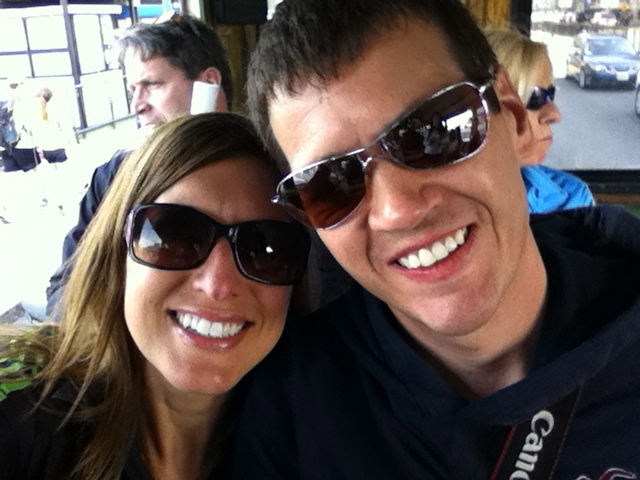 Here are some travel tips I have from our adventure that you may find helpful. 1) Know your route and the options you have along the way. Weather can be nuts. 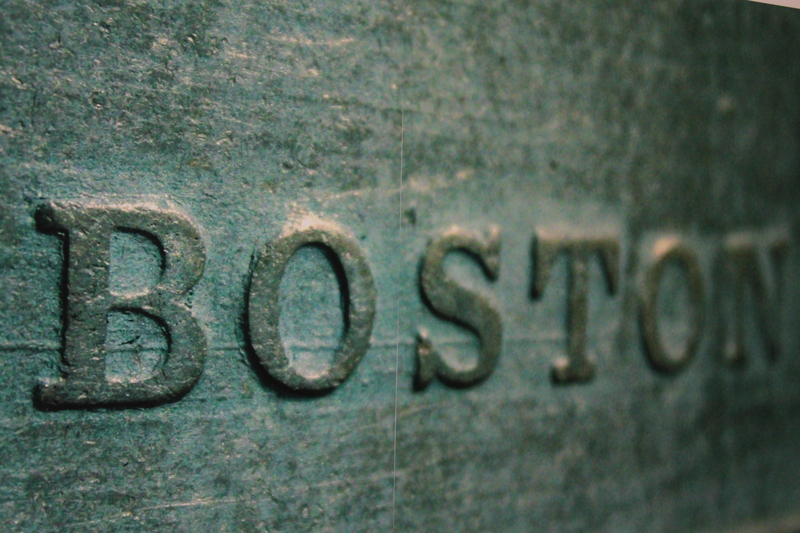 While we have never had an issue getting to Boston, it could happen. In fact, one of our trips to Las Vegas got cancelled due to unforseen weather that was impassable. 2) Give yourself enough travel time. If your schedule allows, give yourself a day buffer so you could still get to the race using your alternate route or after weather clears. I figure, if the weather is that bad, no one is flying either so it’s better to add a buffer of time and see if you can safely get to your destination, if not then you have to be ready for that too, driving or flying. For us it’s the Boston Red Sox. 🙂 We figure as Cub fans they aren’t in the same league so it’s not a conflict of interest. 🙂 Heck, while we are Cub fans, if they aren’t playing we root the home team and get into it. Cub fans and Boston fans are similar, they both like to party and really get into the game which makes it that much more fun. It feels like you make friends with everyone around you at both ballparks. 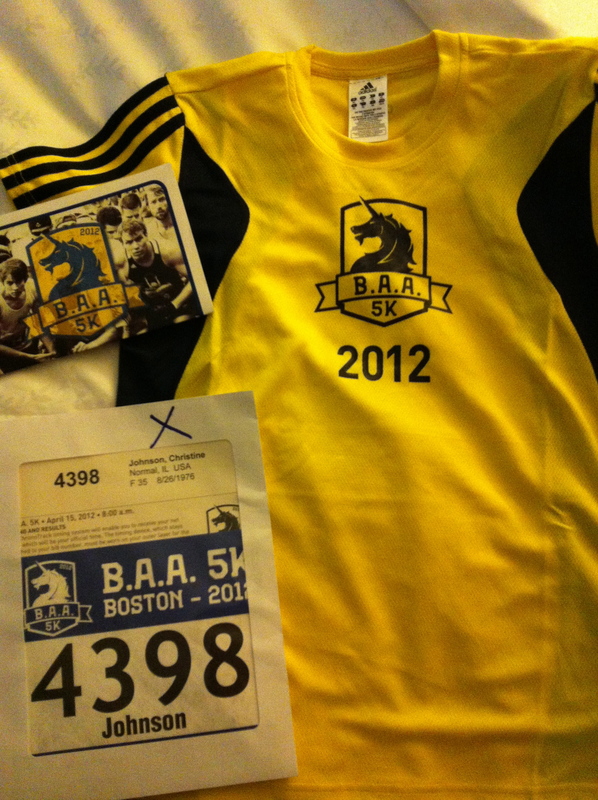 Something that we added to our agenda in 2012 was running the BAA 5K the day before for fun. Definitely consider doing this! 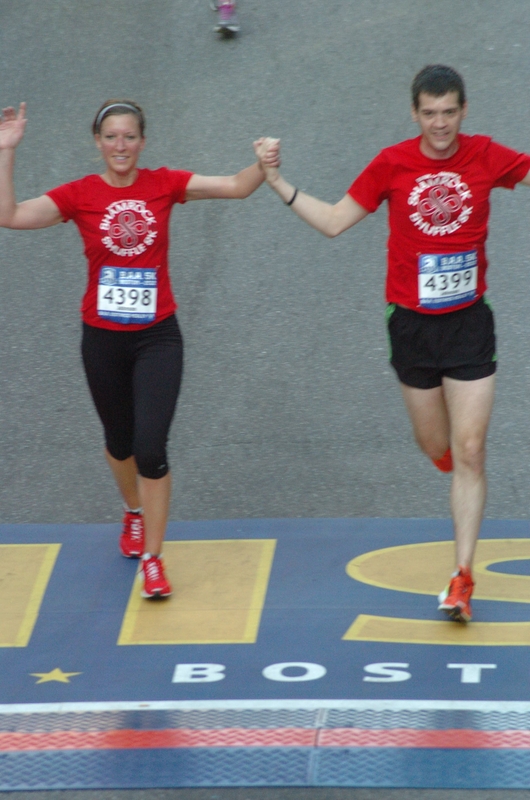 It was so nice to get to run this with Rob and enjoy seeing more of Boston Commons with him. Maybe if you are from the east coast, this is no biggie. For me, I LOVE seafood. So it’s a must do in Boston. 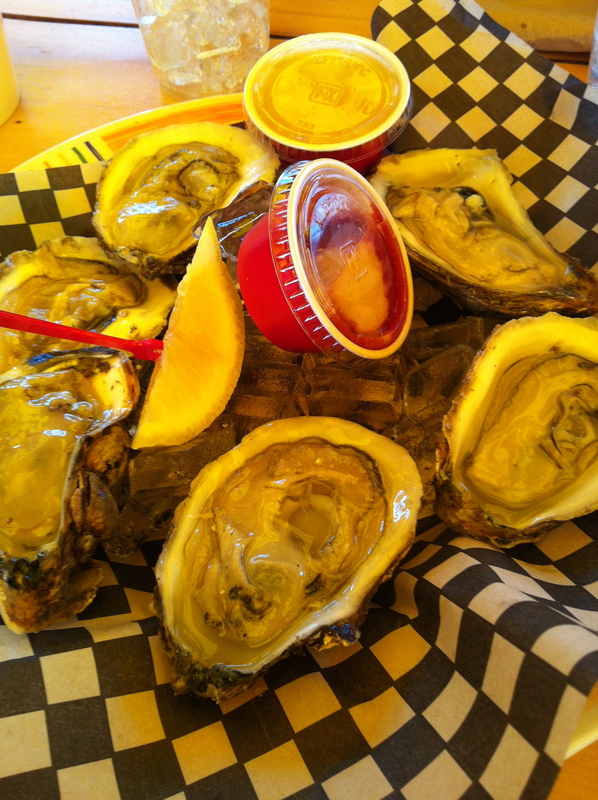 Get the chow-da, get the lob-sta, and oysters on the east coast are different from other places, so try it all! Both visits we met up with Alaina who works for the Fairmont – Copley Plaza. 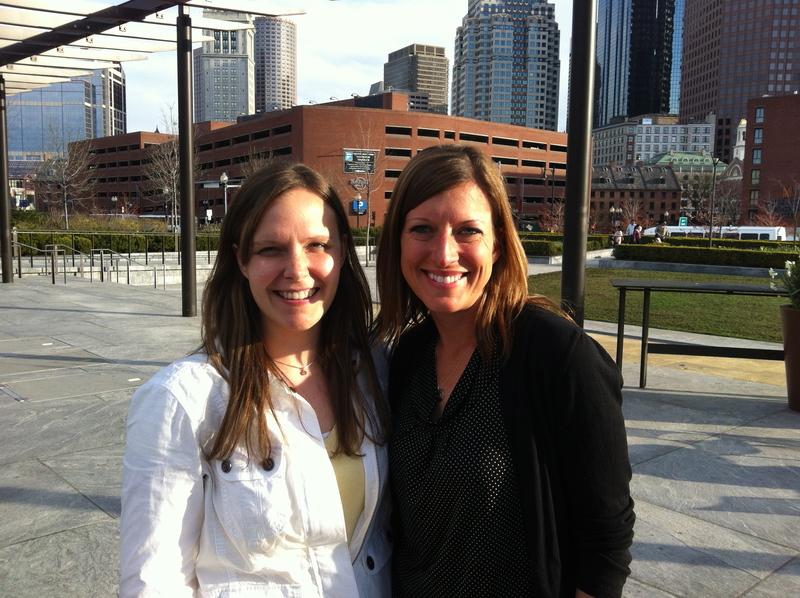 She is such a sweet person and it has been nice to get to see her in real life and hang out with a real Bostonian. 🙂 She showed us around the area and to new restaurants. 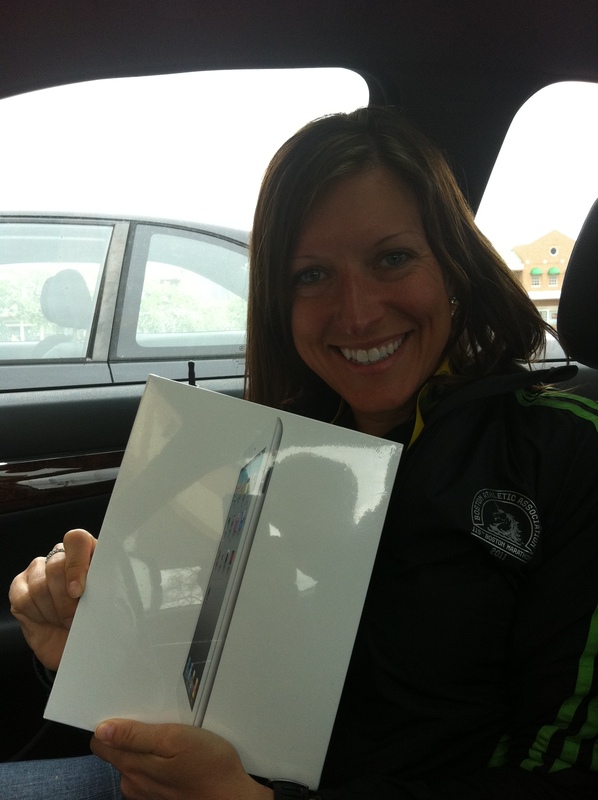 Maybe I got extremely lucky, but I met an amazing lady in Athelete’s Village at my first Boston. I didn’t know anyone else running the race so I was there alone and under prepared on what to bring to wait around for 2ish hours. Natalie took pitty on me immediately and shared everything, her blanket, her extra set of throw away pants, and food. Even without all the goodies she was just the perfect person to hang out with. 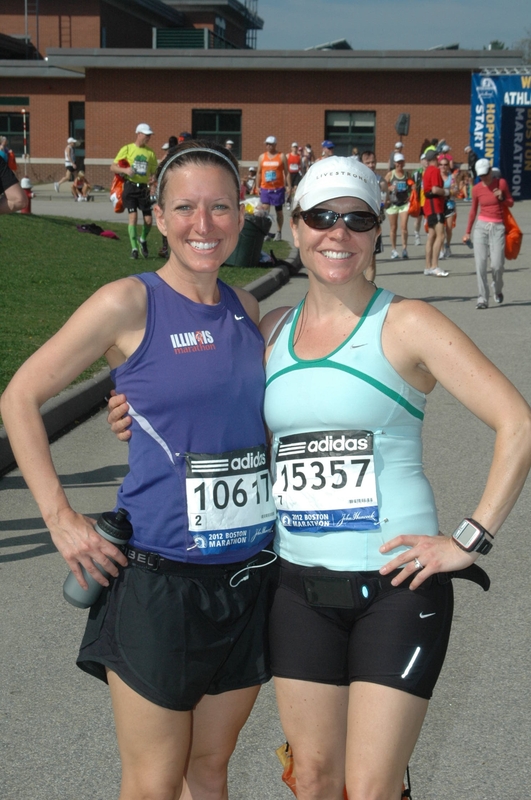 It was both our first time running Boston and we gabbed so much that time flew and I actually forgot about the race and my nerves. Luckily she didn’t find me too dorky and wanted to be friends. 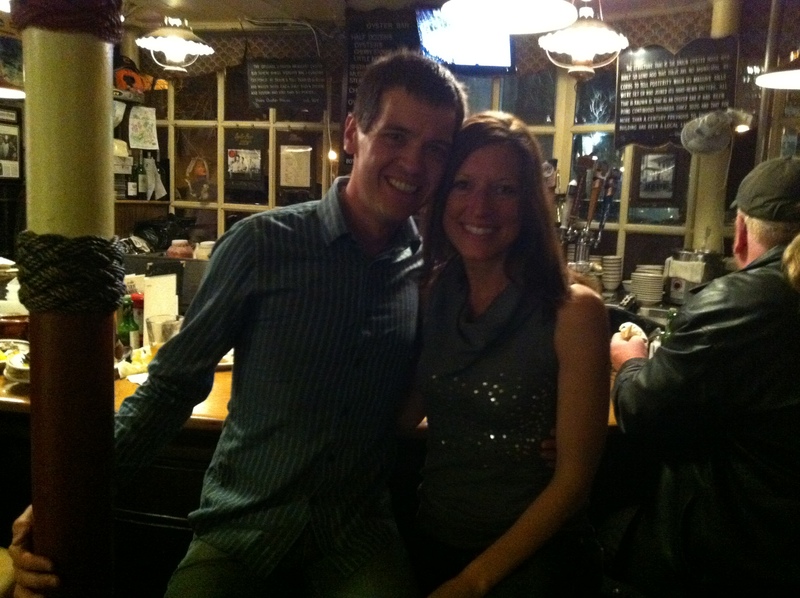 The bonus was that we both were able to run the following year and meet up again! She even brought me Starbucks! 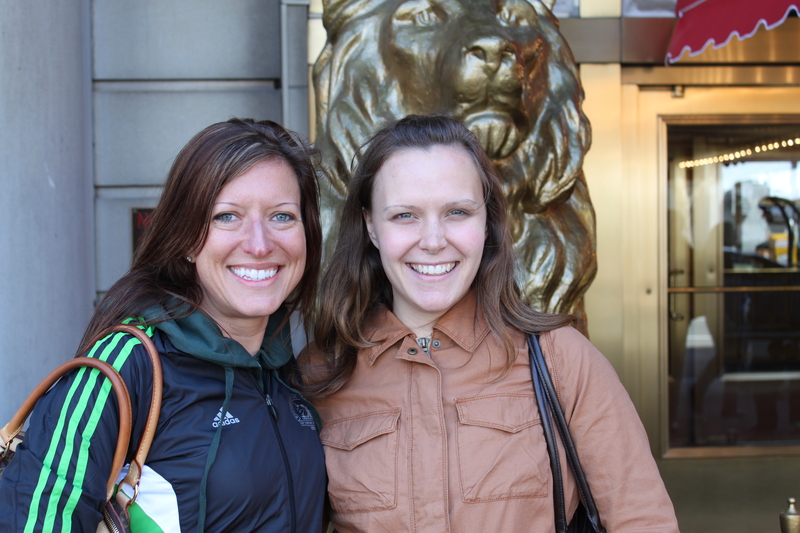 We are totally Boston Marathon BFFs. 🙂 Neither of us will be there this 2013 and while we still keep in touch, I have to say that I will miss seeing her this year as much as the actual race. 2) Come prepared (because I didn’t the first time), in fact bring too much stuff. You can leave what you bring for other runners, donate (there will be people with bags closer to the start), throw things away, or gear check. I will say I’m not a fan of the gear check. It’s a long wait to get your stuff back so instead I have Rob with an extra set of clothes and meet him in the family meet up area. Just my personal preference. 3) If you haven’t done the course and are not from the area (and worse you are from somewhere flat like me), the course is no joke. It’s a complete mental trick and really grinds on your legs. So soak in the run and consider just letting things happen as they come. 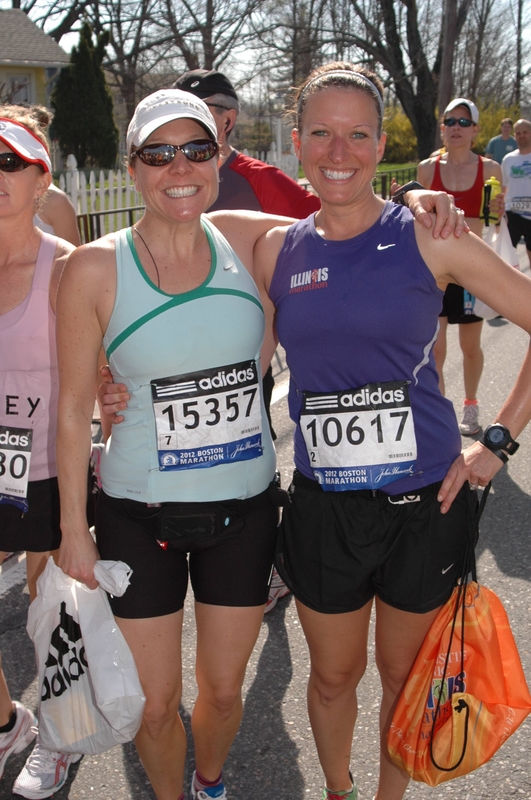 2012 was 85ish degress with the sun unrelentingly baking us for most of the race. Don’t over estimate your power over the elements. If you feel good in those conditions savor the moment, but play it smart and consider not speeding up. There were people throwing up by mile 8 and it was a war zone of people dropping off the closer we got. 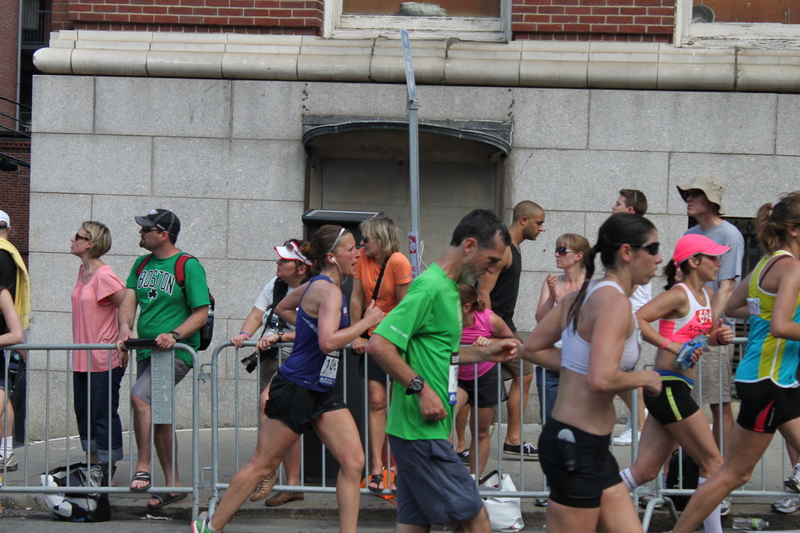 I heard many stories afterward of people who it was their first Boston and they DNFed from the heat. One guy dropped and busted his face at mile 25. 😦 It’s your Boston medal to get and when conditions or your body don’t cooperate adjust your plan and be smart so you can try to finish no matter what. Much like any marathon, you never know what you will get that day, but this race seems to up the ante. 4) Smile, cry, wave your arms and shout….soak it in!!!!! The crowd is amazing the whole way, but when you get to the last 4 miles it really becomes a wave of cheers. I imagine that’s how professional sports players may feel entering the stadium/arena. I burst into tears I was so happy and the crowd just loves it more. They know how much it means to us runners. Show them the love you have for their towns and hospitality. Hopefully I will get to be there again either running myself or watching Rob. 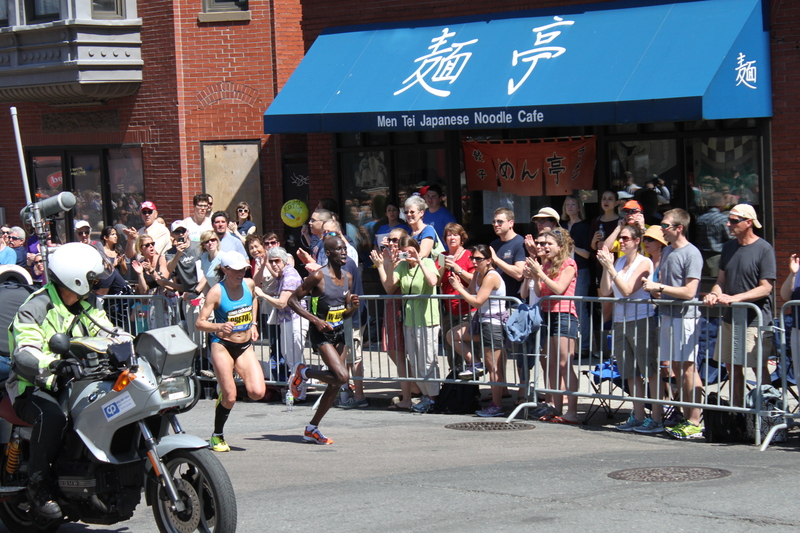 There is nothing like the experience of the Boston Marathon. 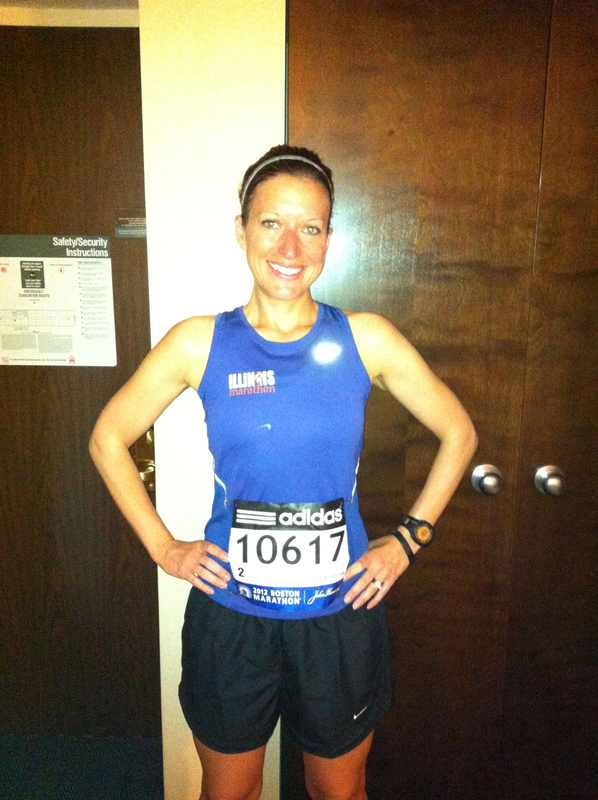 For those of you running, I hope you have a wonderful and safe 2013 Boston Marathon! Celebrate every bit of it, no matter the outcome! 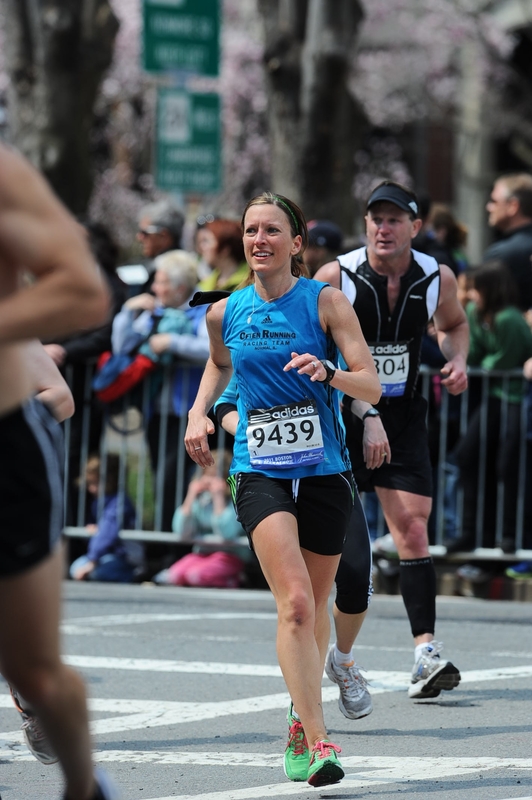 Categories: Boston Marathon, Marathon | Permalink. As you may have heard from others this race was amazingly challenging. The weather was in the 80s and the sun beat down on us 98% of the time. It became a race of pure fight. Anyone who endured this thing should be so proud. And everyone had their own battles out there. Let alone that it’s a challenging course, mixing in those temps it adds a new layer of complexity that only those out there could understand. 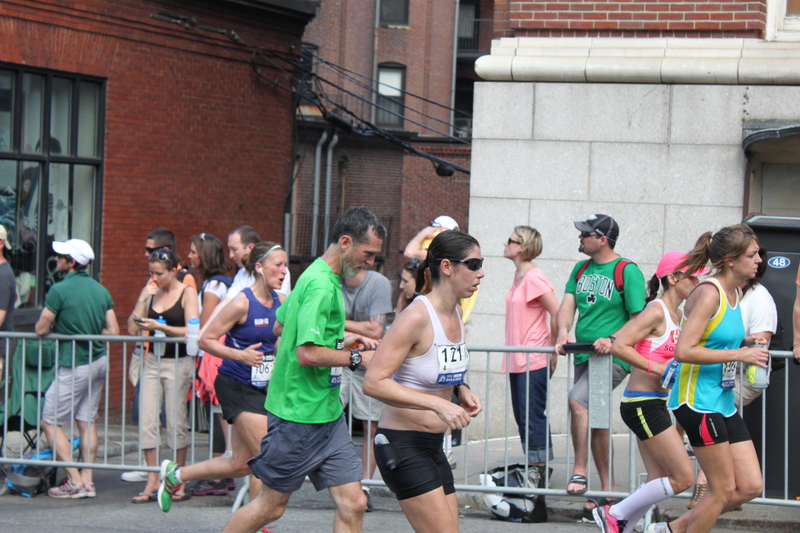 I hope that other running had their bodies cooperate and hold on through it. Now to my story…. I slept really well, better than I have for any marathon. Never was up in the night, no thoughts racing. Instead I blacked out, slept deeply and was up pretty easily at 4:30am. I had everything laid out the night prior so getting ready was a breeze. My stomach was feeling perfect too! I had a hammer bar, soy latte and then we were ready to make our way to the busses by 5:30am. I brought my tunes for this marathon. 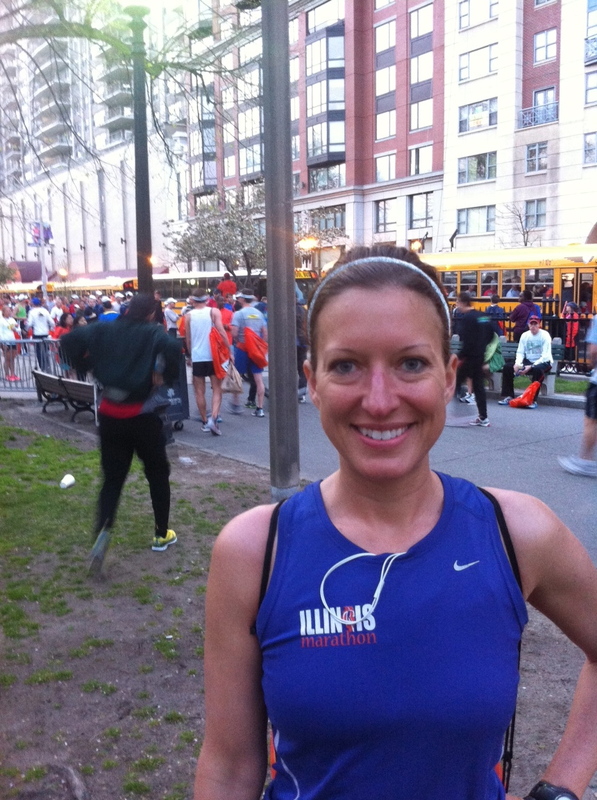 I haven’t run with music in a marathon in a while, 2010 Chicago Marathon I think. I like having a small handful of songs that I can play to keep me mellow during the race or pump me up and I can turn it on and off at different parts of the course when I need it. Last year I got to the busses right at 5:00am. I wanted to make sure I was in line with no issues. This time I was thinking that 5:30 won’t mean I’m on the first busses, but still on in a decent amount of time. 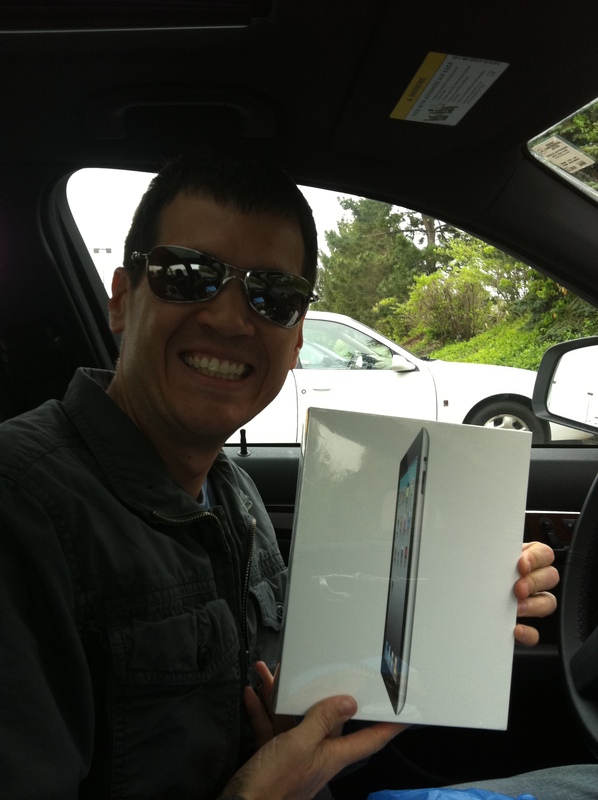 As you can see behind me in this picture, the lines are not too crazy yet. Rob got a couple pictures with is phone of me walking to the bus and getting in line. I was able to get in line and on a bus in a decent amount of time, but there were people trying to cut in front of our line pretending like they didn’t know this long line existed, yeah right. I informed them that the line ends much further back. By the time we loaded our bus a mass of people arrived and the lines became just a sea of people and mayhem. 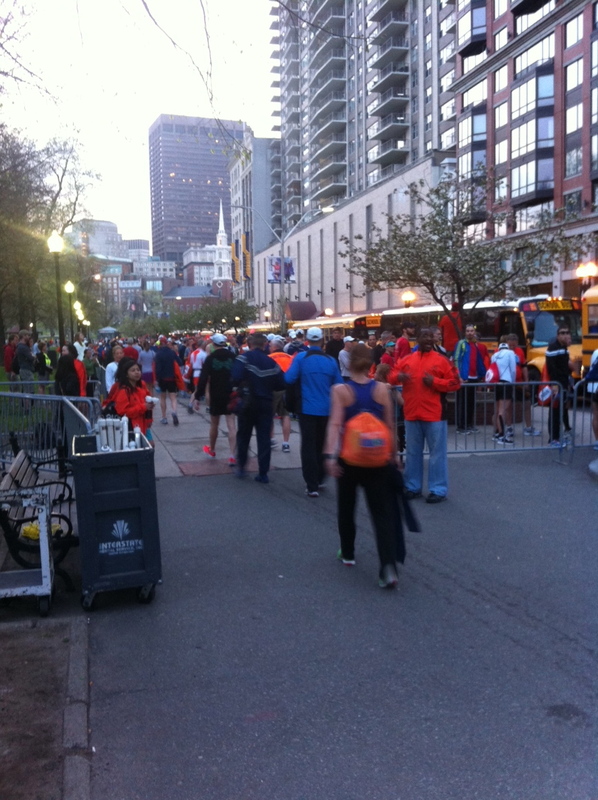 If I ever get to race Boston again I won’t this late to get to the busses again, it’s just not worth the hassle. Our bus ride wasn’t the smoothest. The bus got turned around and it added at least an extra 20 minutes. There were guys on the bus who said this happens every year, no biggie. That was alright except I was trying to meet up with my friend Natalie at 7am. We met while riding the bus last year and in our few hours of hanging out at Athletes Village I felt like I had known her forever. I was so excited to meet up with her. She was getting a ride into Hopkington and was even brining me a Starbucks! Isn’t she the best?! Well we weren’t going to be there by 7am and it was more like 7:40. The bus parked far away from the entrance and the runners were pretty grouchy about the walk. I didn’t do a good job of picking a meet up place to find Natalie. I said “I’ll find you at the end of the food table.” and not knowing what I would wear year I did know I was bringing an orange IL Marathon bag as I was not gear checking. 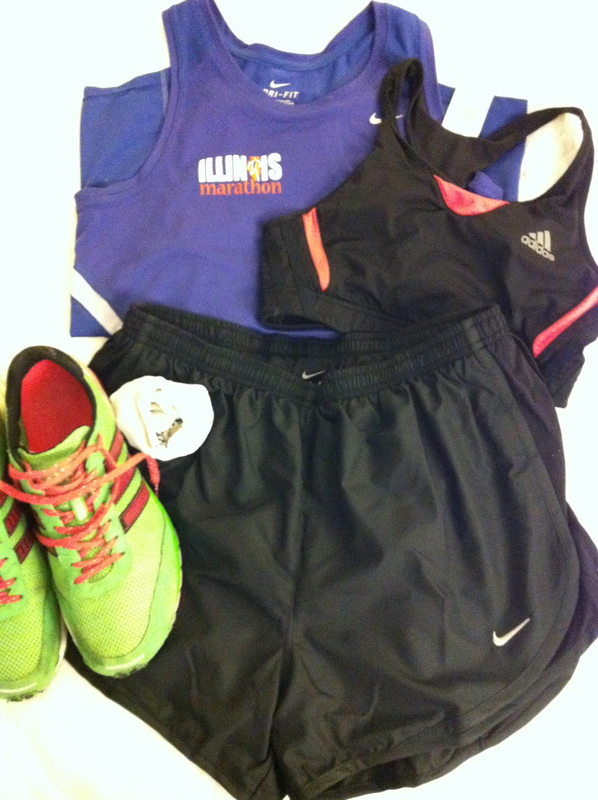 I said “I’ll have an orange IL Marathon bag.” Not a great choice when everyone is carrying orange gear check bags, duh! Natalie says she’s wearing a blue shirt and that wasn’t going to be easy to pick out in the crowds. I stood at the end of a food line, the first one in the entrance and it seem sparse. I realized I wasn’t at the main food tent and then made my way there. It was a sea of people. I stood around for a while looking around and resigned myself to the thought that we weren’t going to meet after all. I pulled out my blanket/snuggie and parked half shade, half sun in hopes that she may re-look for me here. Within a few minutes I hear “Christine!” and Natalie comes to tackle me and says she could see my green shoes from far away and that she got a primo-spot in the shade under the tent. Natalie always takes care of me (based on two years, but that’s still always). We then spend our time gabbing about the logistics of her driving in, me and the busses, athlete’s village, the temps and the race. 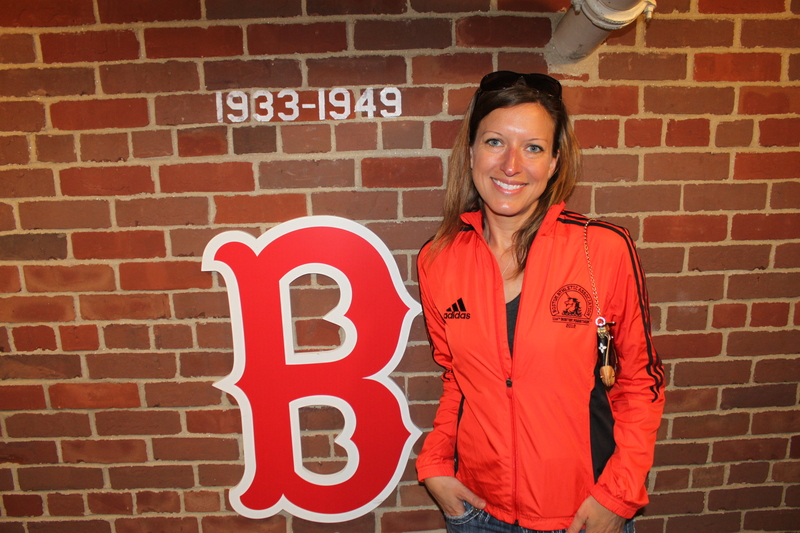 Hanging with Natalie feels like a part of the Boston Marathon tradition. We even told a couple of people that this is our annual reunion, which technically is true. Time passed by quickly and was so relaxing. I had a chocolate chip bagel at 8:00am and a banana at 9:00am. I sipped on Hammer Fizz in my water the whole time and took one Imodium at 9:30am. We both thought the gear check retrieval is too much of a wait so we didn’t have anything to check and made our way to Wave 2 start. One last coat of sunscreen for good measure and we were set. It was baking hot and still we were optimistic that we would slow our pace in the heat, but that it would be more manageable than it would turn out to actually be. We hug, say our goodbyes and well wishes and jump into our corrals. It was barely a 2 minute wait and we were off and going. My “plan” was to run near 8:00s as long as possible and if the heat got to me to back off more. This would on a normal day would be a backed off pace for me so I felt good and conservative out the gate. I kept relaxed and people were passing me like crazy. I noticed the biker bar on the left at mile 2 and they are great! There cheering and energy was infectious. The course is up and down from the start, but I was happy to see my pacing start off so even: 7:53, 7:53, 7:57. I hit 5K in 24, 10K in 50. I started gatorade and water at every stop from mile 4 on. I had a Hammer Gel at mile 7 as planned and it stayed down. My stomach was feeling so good! At mile 8 I felt like “man this is hot, this is going to feel awful in the miles to come. I’m going to have to back off my pace.” 15K at 1:17. Still feeling like this is alright. So many people were walking by mile 11 and it made me think that today is going to be a long day. People were already puking tons of liquid. I felt lucky that I only had two little throw ups in my mouth along the way and otherwise my stomach did SO well. This is where things get blurry. I had wicked quad cramping in both legs that I’ve never had before sometime before the half, but I can’t remember it was before the Wellesley girls or after. It wasn’t just pain, it was full on muscle seized up, unbendable legs. I stopped and did quad stretches and had to walk a water stop to get them to loosen up. It was extremely painful and I was worried it would be something I wouldn’t be able to shake off, or worse, what if my whole body did this? I would surely drop to the ground. 1:51 at the half and I’m thinking if my legs can throw a fit and we aren’t even at the hard part this is going to be painful. I know under 4 hours is not likely if the first half is any indication of what could come. I got back to running as well as I could and ignored my pacing and got into managing my effort level to try and keep my legs happy and to avoid what others were dealing with around me. So many people were at the medical stops, puking and fit people sitting on the side of the road. Even when my legs felt better I was conservative because I didn’t want to make a bad choice that would stop my race altogether, it was such a gamble on how much effort was good. I felt like I was able to notice more of the towns this year than last. I distinctly remember signs for Natick, Ashland, Wellesley, Newton and so on. That was nice. I felt like while things were so crazy I was still able to take in the race better this year. The water and gatorade stops were complete mayhem. The volunteers were working so hard and couldn’t keep up with the demand. Many stations we had to grab cups ourselves or wait for them to be poured. I made it a point to get fluids every time there was nothing to be gained from rushing through. Thank you volunteers for everything you did! It was greatly appreciated! The crowds were so amazing! They were in full effect, so encouraging and even more importantly they were supporting us runners with wet sponges, ice, water, and hoses. We all took advantage of their offerings and it felt so great to have an ice cube or a garden hose on full blast hit you. 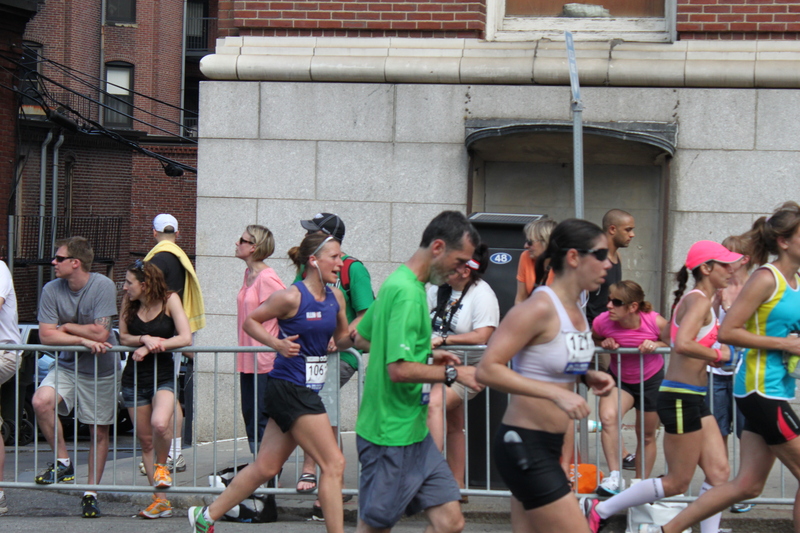 It was so gratifying to run past the porta-potty that I stopped at mile 15 this year and have a stomach that felt so good! Meanwhile I’m running Rob did a long run on the hotel treadmill, got cleaned up, watched the wheelchair and elite starts, and then got down to the race on the before Boylston to keep tabs on my progress and take pictures. He said it was heartbreaking to see elites struggling in the heat and to hear some may have dropped out. Here are some pictures he took. 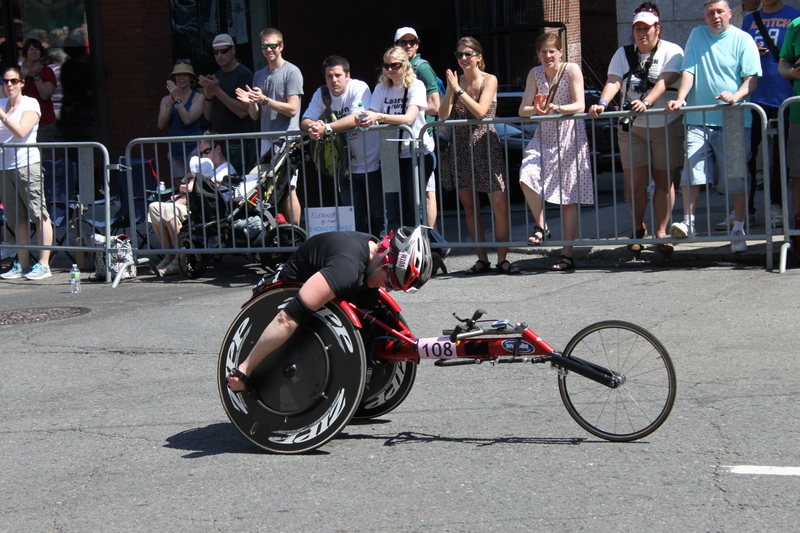 The men’s wheelchair record was broken by Joshua Cassidy with a 1:18:25. Rob wasn’t down there in time to see his finish. Here is another racer toughing it out. 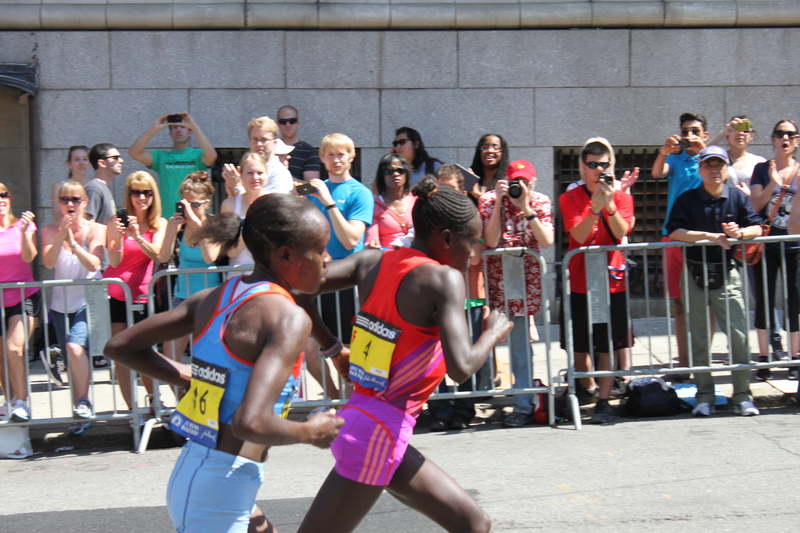 The women’s elite finish….it was that close, but Sharon Cherop (pink shorts) took the win with 2:31:50 and Jemima Jelagat Sumgong was just 2 seconds behind her. What a battle! Wesley Korir took first for the men with a 2:12:40. Back to my race…My legs seized up 4 or 5 more times, turning into in movable limp walking until the pain would subside enough that I could run again. I ran up heartbreak and felt victorious even in my pitiful state. I felt like I was conquering the awful. Seeing Boston College after Heartbreak was a nice surge of energy. The little rollers after heartbreak were just awful and it took forever to get through the last 5 miles. I knew I wouldn’t break 4 hours. I endured and around mile 23 I enjoyed a purple popsicle. The frozen and fruity taste was so good and so needed. Then at mile 24 the race hit me like a wave of emotion like last year, but even more so because I just endured the most painful race I’ve done so far. I turned my iPod to “Fighter” from Christina Aguliera and hit replay for two miles. I felt like a fighter. I remembered Rob’s comments about getting to the last miles and the pain would be there no matter what so make it hurt. Run as hard as I can move and live in the pain. I psyched myself up on the music and the crowd cheers and got my pace into the 8:30s. My legs were searing pain and I was smiling and crying at the same time. I was so proud of enduring the suffering. Knowing that it wasn’t my best race day, but it was another earned marathon notch. I waved my arms and pointed for home on the turn to Hereford. I didn’t hear Rob but he saw me, cheered and got pictures! 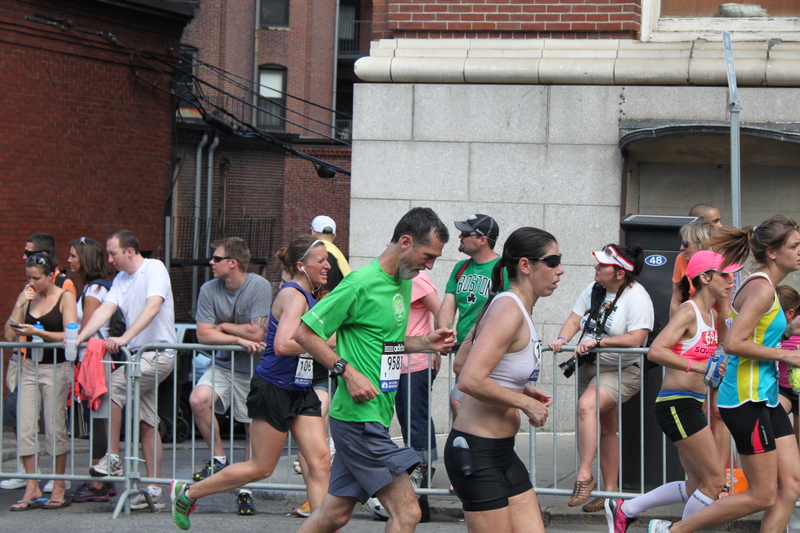 My heart burst open turning to Boylston, knowing it was over and that I’m better for it. I made my way through the finish area and found Rob in the family meet up area with no problems. Rob helped me change my shoes and then I hobbled back to clean up and get lunch. We had originally planned to go to the post race party, but I was so mentally tired from the race that the idea of socializing was just not something I felt like doing. I just wanted to replay the race with Rob and describe as best as I could what we were all going through. As with all races I’m sure there are runners who had a better day than I did and others that had it worse, but at the end we all pushed through our battles and finished a very tough day. 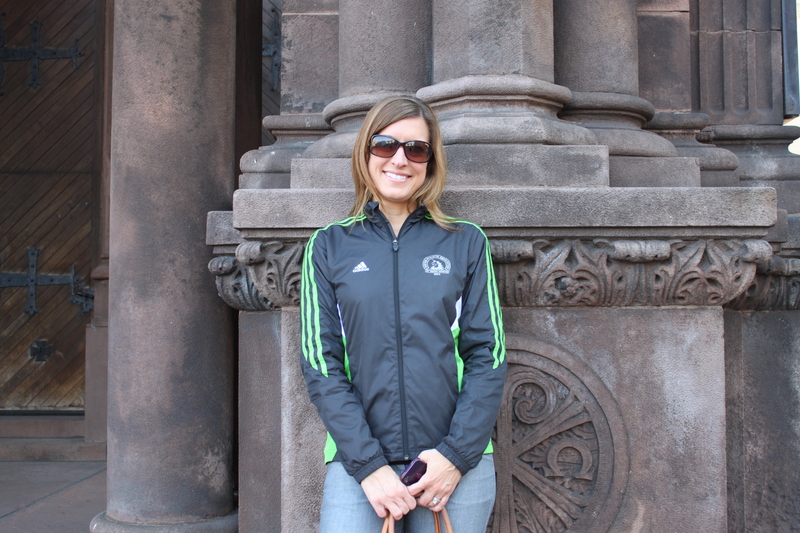 I love that the jacket is bright orange, it is an instant reminder of the scorching hot temps of that day. 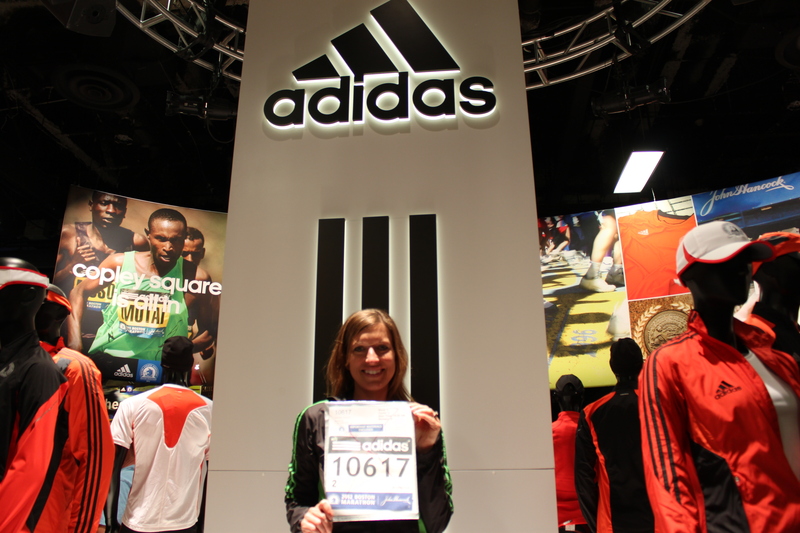 A video of my 2011 and 2012 Boston Marathon. 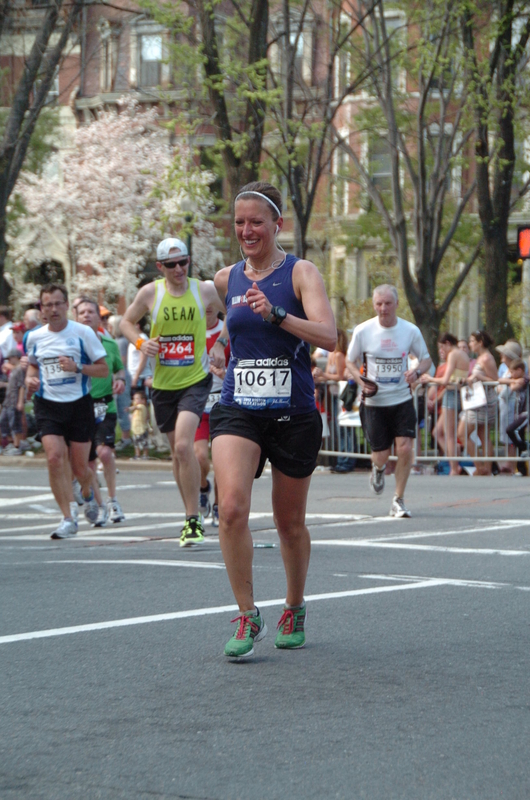 Categories: Boston Marathon, Marathon, Race | Permalink. After a really good sleep Rob and I still got up fairly early to get in a run before our busy day began. We decided to check out the exercise room of our hotel since Rob will be doing a long run on the treadmill Monday morning while I am racing. The fitness facility was really nice and I got in 6 miles easy. Then we got showered and headed out the door to the expo. We decided to walk the ~3 miles to the expo since it was so nice out and we could take pictures along the way. We got to the area and realized we needed to get moving if we were going to make our lunch reservations at the Barking Crab. 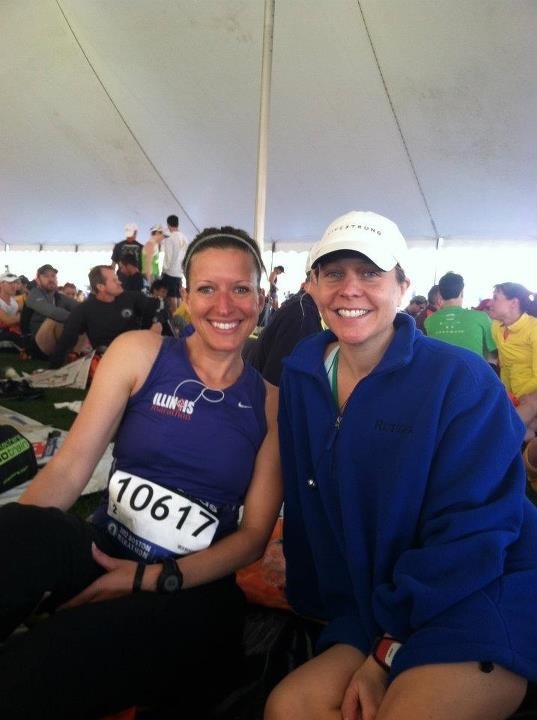 We hustled through bib and shirt pick ups for the Marathon and the 5K we would both be running on Sunday. 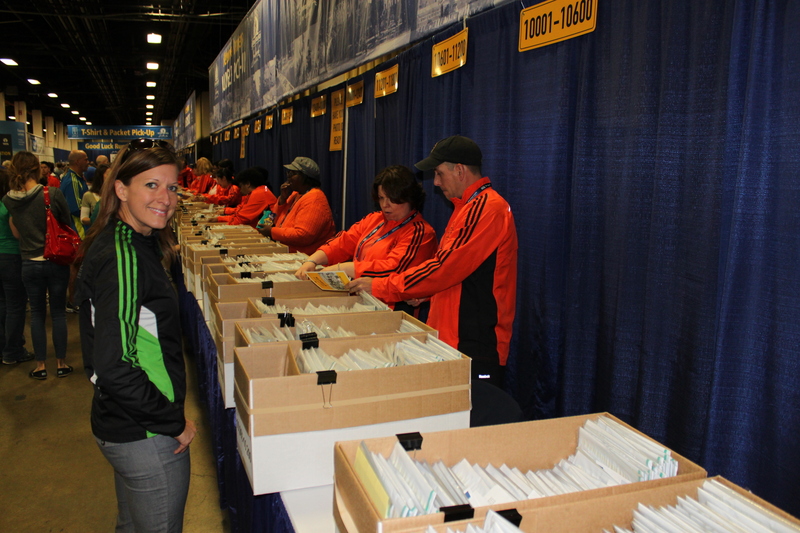 After collecting my bib and shirt we got our 5K bibs and shirts. The merchandise area of the expo was mayhem. They had a section set up right after bib/shirt pickup that was very tight. It seemed to have a limited selection and luckily a nice employee informed us that the major booth was at the center of the expo and this was just a smaller set up with limited stuff. This helped save us some time because we had a lunch reservation to get to. We made our way to the larger adidas store area and grabbed the few things I had my eye on. Since we are tight on time we went to lunch and came back afterward to take a couple of pictures before leaving. 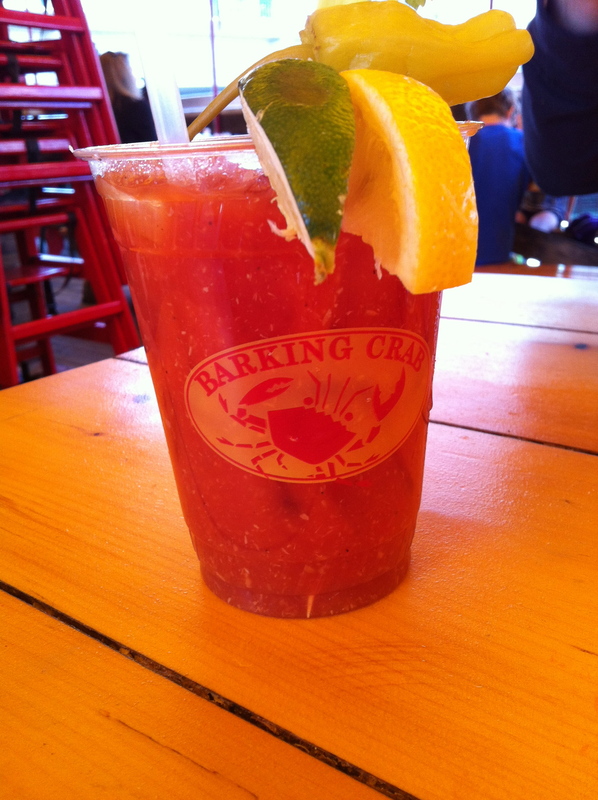 The Barking Crab was PHENOMINAL!!!! One of the best meals we have ever had!! We had a reservation, but if you are fine with getting there at open at 11:30 you may be able to get a sit with little waiting. This place is super popular and we see why. The bloody mary was unique and was lighter in taste, but had bits of crab in it, which is an outstanding idea! 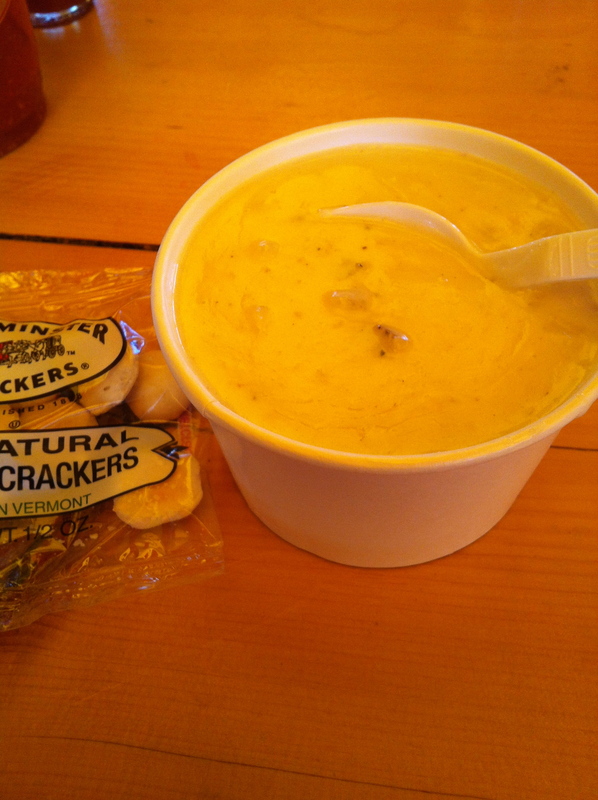 The chowder was very good! The oysters were the BEST EVER!!!! And then finally, literally the best food EVER EVER EVER. 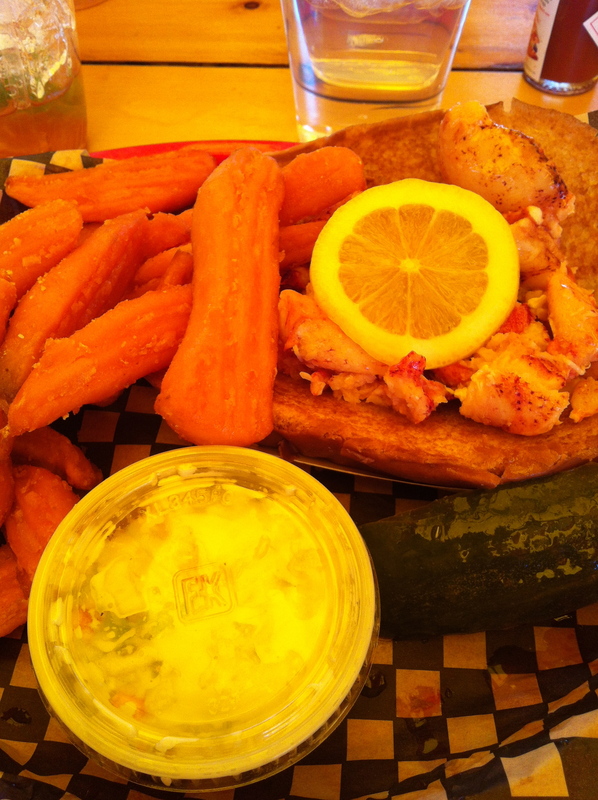 The naked lobster roll!! Holy crap is it good!!! We met a nice couple seated at our picnic table. After chatting with them we rolled ourselves back to the expo for a couple more pictures. Then we took advantage of Nike’s free trolly rides back to Niketown in Back Bay. After a little shopping we got back to the hotel at 3pm to chill for an hour. 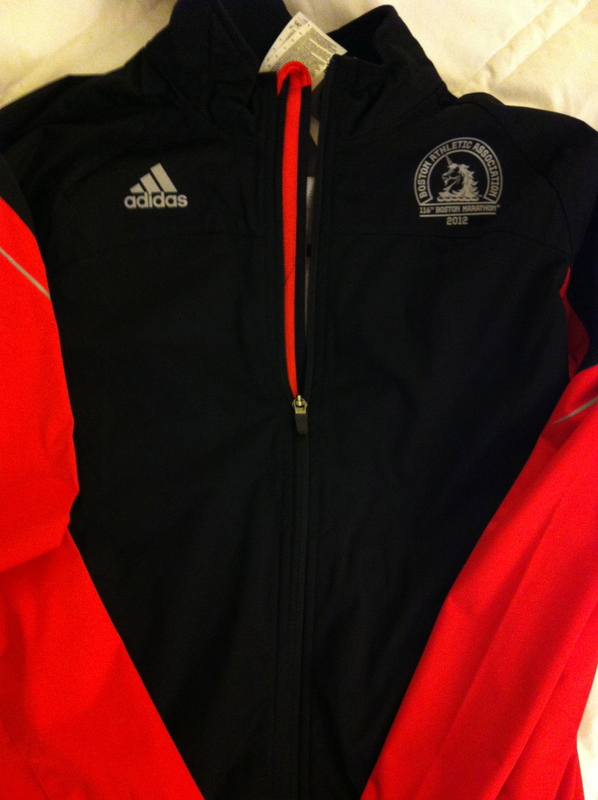 Here is the BAA 5K and Boston Marathon gear. And the item I bought. The Supernova Sequencials Jacket. Rob spotted this and said it would be a sweet jacket, I agree! Supernova Short, I normally wear small in shorts, but these just seemed tiny on the hanger. I panicked and bought medium without trying them on and they are way too big and floaty looking. I will try wearing them with the waistband rolled, but the style just doesn’t work for me after all and I probably won’t by this style again. I do like that they feel very light weight. 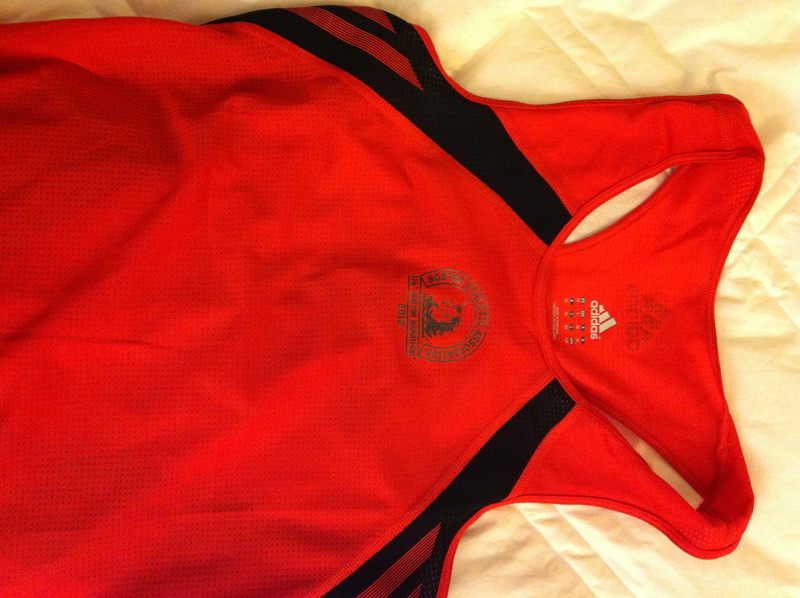 The adiZero singlet. I love the lightweight feel and the design. The singlet is longer than I’m used to, but I think I like that. The arm area is cut and looks funny on me, but I can deal with that. Overall I’m happy this singlet. I LOOOOOOVE the Climacool Speed Backpack and would say that other than the official Boston Marathon Jacket, this bag was my favorite purchase. The bag has so many pockets and compartments. 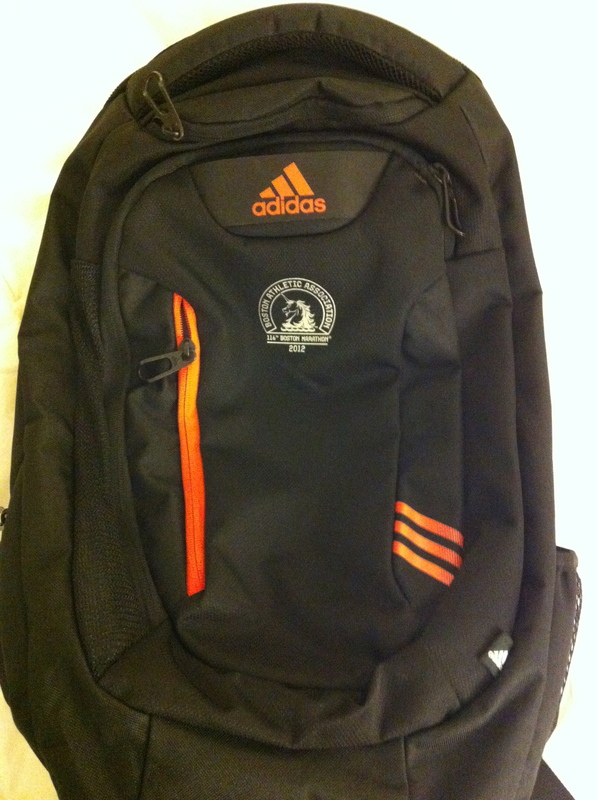 It is streamlined and smaller than past adidas bags that I’ve had. This is just a great bag with well thought out design and is something we will carry for years to come so it seems like a great investment. 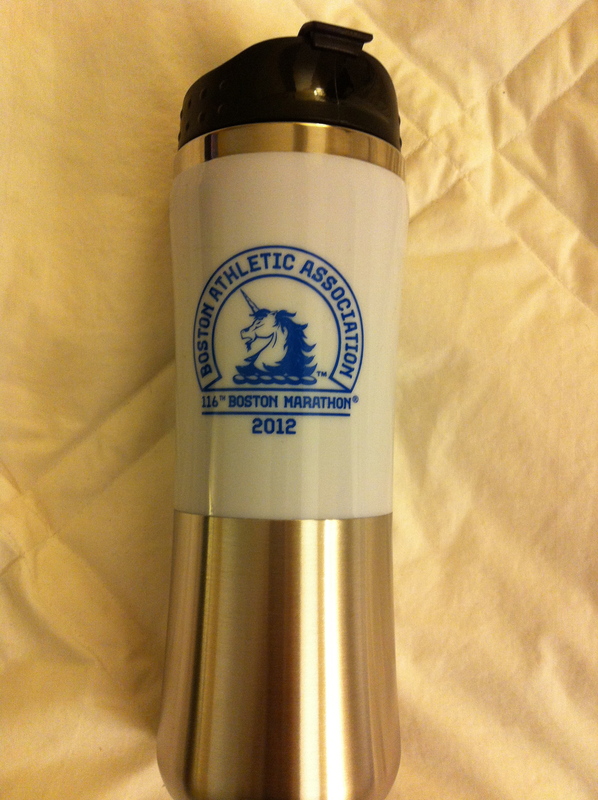 Last year I got a water bottle and I used it often. Unfortunately I dropped it in a parking lot and it caused the aluminum to dent on the bottom so it doesn’t sit flat anymore. This time I thought I would try out the coffee mug since my water bottle still technically still works. And the pilsner glass. Maybe in the future Rob and I will have a larger set of these. I would like one for every year we get to race. I also got a pin and patch (not pictured). After a quick rest, we met up with Alaina and David for a walk and some pastry at Modern.Rob and I got to take the train for the first time through Boston and I’m glad Alaina was there to navigate for us. Then Rob and I took a walk before having dinner at Union Oyster House. 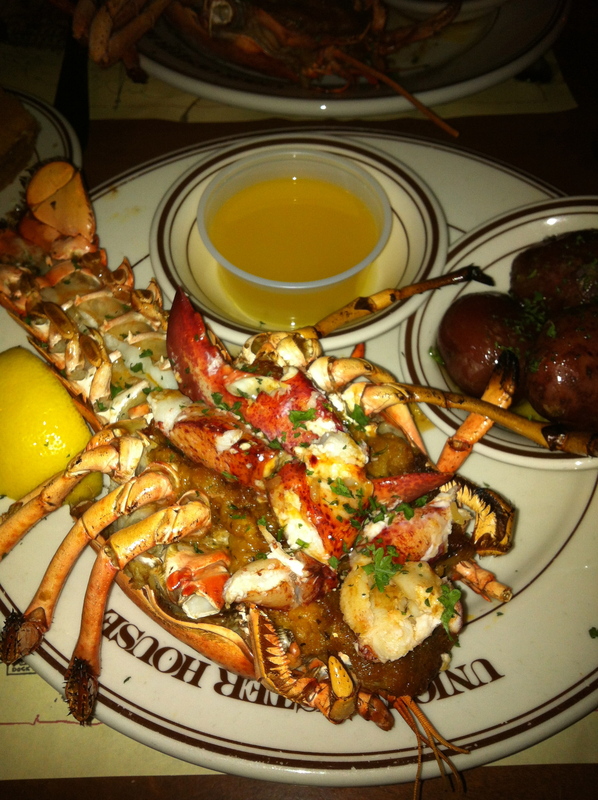 The oysters were good as usual and then we tried something new, the Union Lobster Special. A baked lobster stuffed with seafood stuffing. Delicious, as expected! 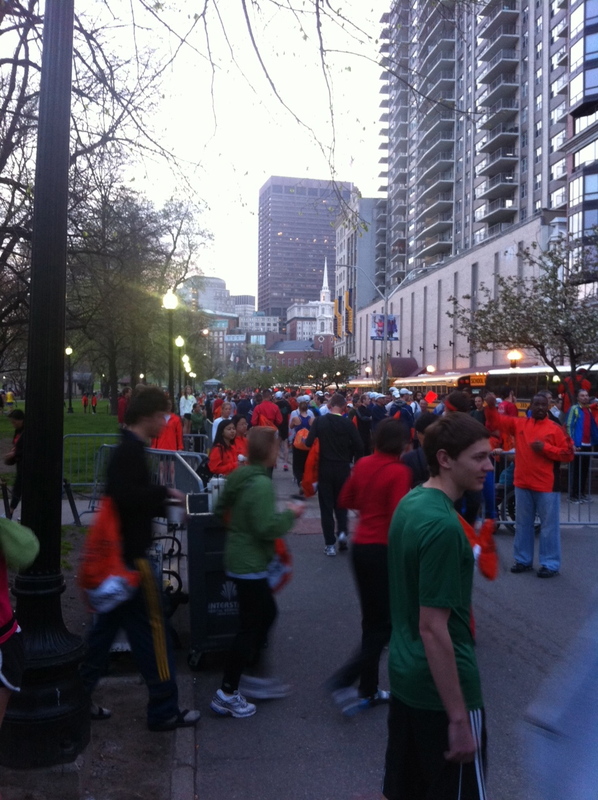 Then it was time to head home to get to bed early so we could get up for the BAA 5K and then to the Boston Red Sox game. 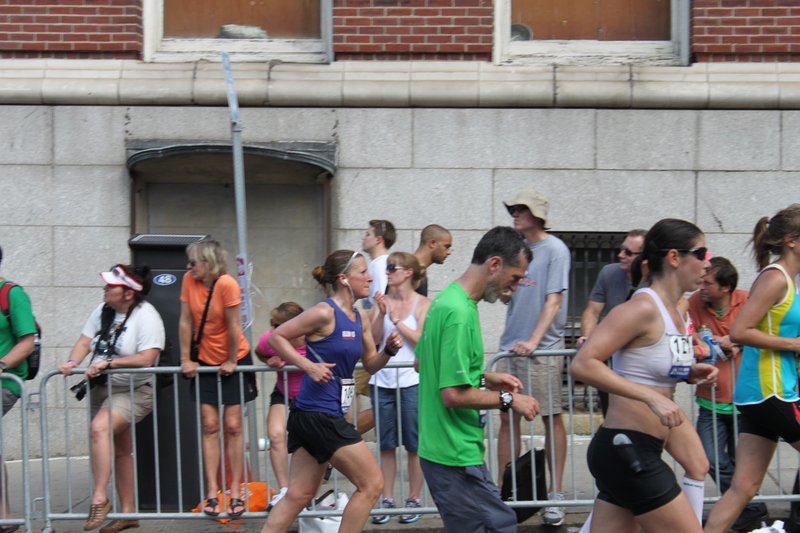 Categories: Boston, Boston Marathon, Expo, Marathon, Travel | Permalink. I can barely keep two thoughts together this week and it has just started! My mind keeps racing with random thoughts and things that need to get done before we leave. Normally I try to organize what we need to pack and race logistics (parking, expo, etc. 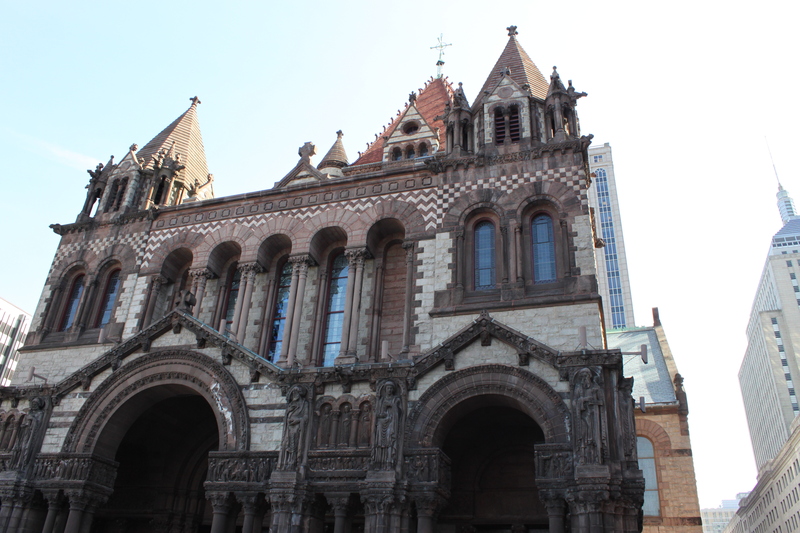 ), but Boston always seems to be on another level. And then there is the keeping a constant eye on the weather, which right now looks really good (knock on wood)! I know the forecast will fluctuate in the days to come, but I hope that rain and winds stay away. Tonight begins getting laid out to pack! 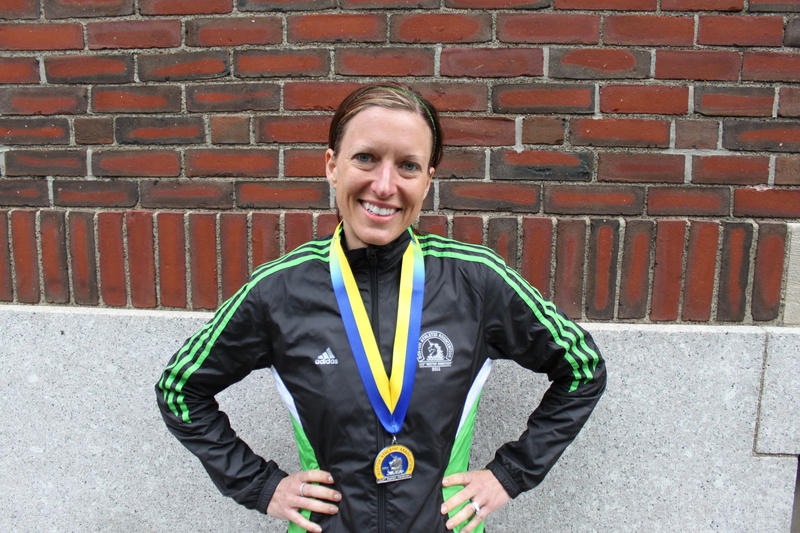 Categories: Boston Marathon, Marathon, Taper | Permalink.